“You need a good, healthy diet – it’s about finding out what your body needs. Sugar is a disaster for skin, as is white flour.” – Thandie Newton. If you’re trying to avoid sugar for dietary reasons, then you’re probably already well aware of the more popular foods that are packed full of sugar. However, there are some foods that have hidden sugar. “Sugar causes diseases: unrelated to their calories and unrelated to the attendant weight gain. It’s an independent primary-risk factor. Now, there will be food-industry people who deny it until the day they die, because their livelihood depends on it,” says Dr. Robert Lustig. “What they knew was, when they took the fat out they had to put the sugar in, and when they did that, people bought more. And when they added more, people bought more, and so they kept on doing it. And that’s how we got up to current levels of consumption,” adds Dr. Lustig. When you’re thinking about things full of sugar, you’re probably imagining processed foods and sweets. But, these aren’t the only things that are full of sugar that might sneak past you when you’re making your meal plans. Check out these foods that have hidden sugar that you probably weren’t aware of. If you find your favorite snack on here, don’t worry – everything is always okay in moderation! The first thing people on a diet tend to pick up out of the food aisle is a yogurt – after all, it’s supposed to be pretty healthy! And that’s true. However, high sugar, flavored yogurt is pretty much the same as eating a piece of candy. Jennifer Jackson, MD, of Ascension Via Christi Health says, “Despite the small carton size and association as a healthy food, a typical low-fat strawberry yogurt can contain 26 grams of sugar per serving.” Plain or Greek yogurt is the way to go if you’re looking for a healthy snack. You can add some fresh fruit slices for flavor if you’re not a fan of plain yogurt. This may seem like a quick, healthy morning meal, but Instant Oatmeal is hiding more sugar in it than you probably realize. Oatmeal by itself is a healthy meal, but the instant packets can really pack a lot of sugar. If you make some overnight oats with steel cut oats and milk, then you’ll have the same thing without all that sugar. Low-fat salad dressing may be low in fat, but it’s definitely high in sugar. When the fat in something is removed, it’s often replaced with sugar for the flavor. Eating your normal salad dressing in moderation may be better than just replacing it with high-sugar varieties. After all, everything can be okay in moderation. A lot of people reach for a sports drink when the middle of the afternoon rolls around. After all, it seems like the right thing to do in order to get that final burst of energy to make it through the day. However, sports drinks boost your energy by – you guessed it – caffeine and sugar. Sports drinks are for people who are doing intense sports regimens, not trying to make it through the day. How could anyone have anything bad to say about granola? After all, it’s often touted as one of the healthiest foods out there. Unfortunately, a lot of brands that make ‘natural’ granola also add in sugar for the flavor, like honey and molasses. If granola is still your favorite snack, look for high fiber granola, which tends to have less sugar. Fruit! It’s natural! It’s delicious! Of course, it has some sugar, but how bad can it be? Dried fruit that’s ready for on the go snacking tends to have as much sugar as your average candy bar. You also tend to eat more, because you don’t conceptualize there are five or so fruits mixed up in the bag! Low fat and diet frozen meals are all the craze for people who need to diet on the go. Unfortunately, these frozen meals can pack 20 to 40 grams of sugar into a serving. “… food processors usually remove fat to lower calories, but they replace it with some form of sugar so it still tastes good. We see the outcome of this practice in the obesity and diabetes epidemics,” adds Dr. Leigh Erin Connealy. Like most low-fat things, when the fat is taken out, it’s replaced with sugar, and usually way more than you need. Another on the go snack that isn’t as healthy as it may seem. After all, many people tend to grab a snack bar instead of a candy bar because they think it’s much healthier. While it can be, snack bars tend to also have a lot of sugar. Make sure that your snack bars have low sugar before you chow down. One of the new post-workout drinks is coconut water, due to the fact that it has plenty of electrolytes. However, if you’re not working out regularly and drinking it after your workout, you may just want to stick to regular water, since coconut water has all kinds of sugar. “Often the sweetened and unsweetened varieties are in the same area of the store, making it confusing to make a good choice. The nutrition facts table also accounts for a serving size that is one-third to one-half of the actual bottle,” says registered dietician Alysha Coughler. While it may taste good and feel good, it’s too sugary for day-to-day drinking. This is an easy to make breakfast, especially for people who are on the go. Of course, there are all kinds of dangers when it comes to downing your favorite cereal. 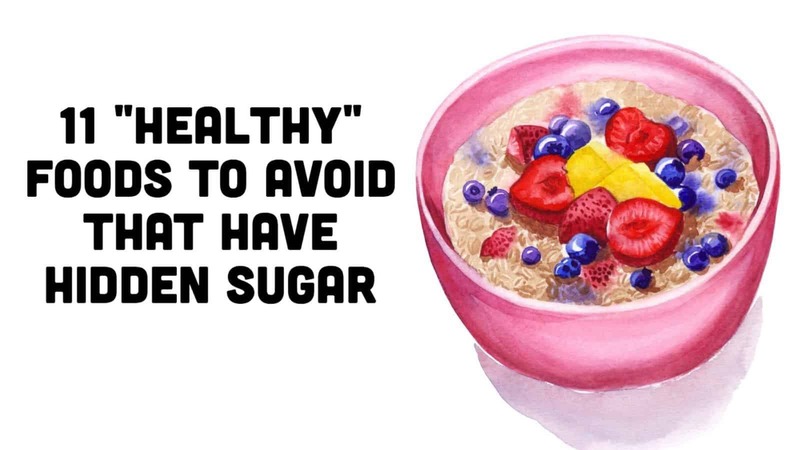 Plenty of breakfast cereals, even ones that are supposed to be healthy, are full of sugar. Plenty of low-sugar cereals don’t matter, because we often eat way more than the recommended serving size, which means we’re getting more sugar than we need. How can anyone disparage bread? It’s plain, it’s simple, it’s delicious! But it’s also full of sugar, especially if you’re enjoying a savory kind of bread. High fructose corn syrup is usually one of the main ingredients in bread. “Unless you are baking it yourself, your bread probably contains added sugar. Most likely it is in the form of high-fructose corn syrup. Just because it says “multi-grain” on the label doesn’t mean it is healthier than white bread. Both can have added sugars,” adds Dr. Avena. There you have it! Sugar can sneak into our food in ways that we don’t really expect. You don’t have to be buying a bunch of processed foods and sugary sweets to accidentally be feeding yourself more sugar than you need. Keep an eye out for these foods and their healthy alternatives.